Ayurveda often connects joint pain to Vata dosha. While other factors contribute to the development of arthritis and joint pain, an imbalance in Vata dosha is almost always involved. For this reason, one of the most important Ayurvedic recommendations for balancing Vata is regularity in one’s daily routine: eating at the same, exercising at the same time, and going to bed at the same time every day. Modern science now lends strength to this seemingly simple Ayurvedic “fix”. Research studies conclude that regular meal times, exercise and bed times could help keep help avoid and/or minimize the pain of arthritis. According to researchers, tiny biological clocks exist within our cartilage cells, which control thousands of genes that are involved in keeping in keeping our cartilage healthy and strong. The most common form of arthritis is caused by the wear and tear of cartilage that helps our joints withstand the strain of lifting, kneeling, bending, gripping, etc. When the biological clocks in our joints are working properly, the genes are timed to be activated at different times of the day and night. This allows the daily repair to happen in progressive and sequential steps. As we age, however, our biological clocks in our joints can stop working properly and the repair process no longer gets carried out as it was designed. Researchers found that the simple act of keeping a regular daily routine actually helped keep the cartilage clocks working properly, allowing them to support the self-repair of the cartilage. The study concluded that not only can a regular routine delay the onset of arthritis, it could also help relieve pain in those already suffering from the condition. Ayurveda has long understood the role that the body’s circadian rhythm (our built-in body clock) has in maintaining proper functioning of the physiology. Now modern science supports this understanding disruptions to this process can contribute to the development of osteoarthritis. In many cases, wear and tear in the joints are aggravated by the accumulation of ama. When ama, the toxic residue that results from poorly digested food, enters the blood stream, it can build up in areas of the body, including the joints. To remove ama from the joints and tissues, the traditional Ayurvedic treatments for purification and detoxification, known as Panchakarma, can be very helpful. These treatments help bring the aggravated doshas and accumulated ama back into the digestive tract for elimination. Once ama has been cleared, a program of prevention can be recommended. This will include lifestyle, diet and herbal recommendations that will help keep Vata in balance while supporting proper digestion so that ama no longer accumulated in the body. Joint pain can be debilitating, limiting activity and affecting many aspects of life. While there are medications that can help manage the pain, these often tend to have temporary effects and in many cases, severe side effects. Ayurveda offers a natural approach to pain relief without any harmful results. Joint pain and arthritis are usually associated with Vata imbalance and often include a build-up of ama, or internal toxins. Following a Vata-pacifying diet, getting to sleep on time, and being regular with one’s daily oil massage can often help reduce symptoms of Vata imbalance. Ayurveda also offers a number of helpful massages that can be enjoyed either as a part of Panchakarma treatments, or as day spa treatments. A consultation with an Ayurveda expert can help you to decide which approach could best help with your specific condition. Abhyanga: This is a two-technician, synchronized, full body massage with herbalized oil that lasts about 45 minutes. The herbalized oil is selected according to your specific level of balance or imbalance. The massage is done in seven standard positions so that all the joints and large muscles are addressed. Benefits: Most Ayurvedic massage is done by two therapists working in synchrony on either side of the body. This is said to help balance the left and right sides of the brain. The oils lubricate joints and release toxins, while the gentle, rhythmic strokes stimulate the body’s lymphatic system and relax the muscles. After receiving this treatment for a number of consecutive days, the body begins to absorb the oils, which help lubricate the many channels of the physiology and remove deep-rooted toxins. Abhyanga helps to relieve joints and muscles from stiffness and pain. The treatment increases blood circulation, which in turn encourages the removal of metabolic wastes and toxins. It is often recommended for anxiety, fatigue, circulatory disorders, rheumatism, arthritis, and backache. It helps in treatment of sleep disorders and induces a general sense of well-being. Pizzichili: Pizzichiil literally means “squeezing”. During this treatment, warm oil is pumped through hoses that are held by technicians as they perform a synchronized massage. Guests have described this massage as “river of velvet” that both heats and relaxes the body. Benefits: Relieves body pain and muscle spasms, helps preserve and promote optimum health, increases immunity, and promotes health of muscles. The massage also helps ensures improved blood circulation. A soothing and relaxing procedure, it is very useful for rheumatic disorders, arthritis and, diabetes. It can also be very effective in helping with symptoms of asthma. Pinda Swedana: This massage involves massage of the body with boluses of cooked rice. The rice is first cooked with milk and an herbal decoction. This is a strengthening fomentation that can be helpful with a number of neurological disorders, rheumatism, arthritis, joint pain, and even injuries. This therapy is done in the seven standard positions. Benefits: Strengthens the body, rejuvenates the tissues, improves muscle tone, improves blood supply by cleansing the channels of circulation, and is traditionally said to be effective with diseases of the nervous system and others such as chronic rheumatism, osteoarthritis, and gout. It is said to make the body strong and sturdy, nourish the body, and increase immunity. It also gives softness and luster to the skin. The Ayurvedic approach to creating health has two goals: to restore balance to the level of underlying biological intelligence and to open the channels of communication and circulation. This helps bring re-establish the lively coherence between biological intelligence and the material level of the physiology. At its deepest level, the body is a network of intelligence that is constantly being influenced by our mental state. In fact, Ayurveda holds that all health problems are ultimately due to “mistakes of the intellect.” This is because in the mind-body system that constitutes our selves, “consciousness is primary and matter is secondary”. Enhancing the body’s connection with the network of intelligence at its source is the most important step in creating ideal health. Proper routine of life is also a prerequisite for health. In the majority of cases the imbalances at the basis of disease are created over time by simple life-style mistakes in diet, exercise and behavior that disrupt natural biological rhythms. Impurities blocking the channels of circulation and communication are a major factor in the body losing contact with its own network of intelligence. Most blockages develop gradually over time due to poor digestion, which leads to the creation of impurities (referred to as “ama”), and poor elimination, which allows the impurities to be absorbed into the system. The following examples describe how an accumulation of ama can be at the basis of various diseases. 1)Arthritis: When ama starts to accumulate in the joints, this can create an inflammatory and immune response that creates the symptoms of arthritis. 2) Asthma: When ama accumulates in the lungs, impeding the circulation in that area, the body can both accumulate more allergens and also become more sensitized to those allergens. 3) Cardiovascular disease: Modern medicine describes how impurities block the cardiovascular system. When the accumulating impurities are high in free radicals, they become very reactive with the blood vessel walls and damage them. By the end of January and beginning of February those of us who live in northern climates have peaked in terms of the accumulation of Vata in our physiology. Months of cold, dry, windy weather results in an increase of those same qualities in our bodies: dryness, coolness, movement and quickness. When Vata becomes imbalanced we can experience symptoms such as trouble sleeping, aching joints and muscles, arthritis, emotional instability, high blood pressure, dry skin, increased sensitivity to the cold weather, and depression. With months of cold weather still ahead of us, this is the time to adopt a diet and daily routine that will help settle Vata. One of the most basic approaches to balancing Vata is to follow a regular routine—eating and going to sleep at the same time each day. In fact, going to bed early on a regular basis is one of the most powerful tools available for balancing Vata. In terms of diet, the key word is “warm”. Eat foods that are warming and fresh. The same goes for any liquid that we drink (and we need to be drinking lots of liquid to offset the drying influence of winter heating.) Be sure to drink a number of cups of warm water and herbal teas throughout the day. Never have iced drinks or food. Vata imbalances often lead to constipation. This is another reason to drink plenty of warm fluids during the day. Drinking two glasses of warm water when you wake up can help stimulate bowel functioning. Hot water with black salt can also be helpful in this area. During the winter you may find yourself thinking more about food than you did during the summer. This is because when the cold, dry weather of winter starts to aggravate Vata dosha, our bodies naturally begin to crave heavier more unctuous Kapha-type foods to help counter this effect. In addition, cold weather tends to cause our internal digestive fire to increase, thus creating an increase in our appetite. As long as you don’t eat more than you can comfortably digest, larger portions at meals can help keep Vata in balance. While we don’t want to gain weight and accumulate ama over the winter months, it is not recommended to try to lose weight during the winter. Eat more foods that increase Kapha: those with sweet, sour, and salty tastes. Eat fewer foods with bitter, astringent, and pungent tastes. Avocados, bananas, mangoes, peaches, lemons, pumpkins, asparagus, carrots, beets, almonds, sesame seeds, quinoa, rice, mung beans, and ghee are all excellent Vata-pacifying foods. Along this same line of thinking, daily oil massage with sesame oil is particularly helpful in the winter. The warm, unctuous quality of the oil is the perfect antidote to the cold, dry qualities of Vata. If you are Pitta by nature, you may prefer coconut oil or olive oil, as sesame oil is naturally heating. Ideally you’ll want to heat your oil before applying it. Letting your bottle of oil float in hot water for a few minutes will bring the oil to a nice, soothing temperature. Try to keep the oil on your skin for 5 or 10 minutes before your shower or bath. Stay warm. Cover your ears and head when you leave the house. Because ears are one of the main seats of Vata, it is best not to expose them to cold and winds. Two of the main qualities of Vata are cold and dryness. Make sure the temperature in your home and work place is comfortable. If you have central heating, consider a humidifier to counter the dryness it creates. Because Vata-types are sensitive to moving air it is best to avoid drafts or fans. It can be easy to become a little lazy during the snowy, colder months. Try to incorporate Yoga or some kind of gentle stretching exercise into your routine, as well as other comfortable and easy exercise. Don’t strain or over-do with your winter exercise routine. Vata tends to dry up the lubricating qualities of Kapha in the body. This is why more athletes experience pulled muscles or other injuries during the winter. This is especially true for those over 50 (those in the Vata time of life). Spring is a much better season for vigorous exercise, as the influence of Kapha is at its peak and we will naturally have more strength and stamina. If you find that diet, lifestyle and self-massage are not helping to control symptoms of Vata imbalance, it may be that your Vata imbalance has gone deep into the tissues. In this case Panchakarma, the traditional rejuvenation treatments of Ayurveda, are recommended. Panchakarma removes Vata from the tissues by using various herbal decoctions and oil preparations in combination with specialized treatments to treat the root of the Vata imbalance. Ayurveda has always connected joint pain to Vata dosha. While there may be other contributing factors to the disorder, such as the accumulation of ama, an imbalance in Vata dosha is always associated with arthritis and joint pain. One of the most important Ayurvedic recommendations for balancing Vata is regularity in routine: eating at the same, exercising at the same time, and going to bed at the same time every day. Now modern science lends strength to this seemingly simple Ayurvedic “fix”. A new study from Manchester University concludes that regular mealtimes, exercise times and bed times could help keep arthritis at bay. Apparently there are tiny biological clocks inside our cartilage cells that control thousands of genes that are involved in keeping in keeping our cartilage healthy and strong. The most common form of arthritis is caused by wear and tear of the cartilage that helps our joints withstand the strain of lifting, kneeling, bending, gripping, etc. When the little biological clocks in the joints are working properly, the genes are timed to be more or less active at different times of the day and night. This allows daily repair to happen in progressive and sequential steps. As we age, our biological clocks in our joints can stop working properly and the repair process no longer gets carried out properly. The lead scientist on the Manchester University study, Dr. Quin-Jung Meng, found that the simple act of keeping a regular daily routine actually helped keep the cartilage clocks working properly, allowing them to do their job in supporting self-repair of the cartilage. And the study concluded that not only can a regular routine delay the onset of arthritis, it could also help relieve pain in those already suffering from arthritis. The researchers noted the importance of understanding the role that the body’s circadian rhythm (our in-built body clock) has in maintaining healthy joint tissue and how disruptions to this process could contribute to the development of osteoarthritis. In many cases, the wear and tear in the joints is aggravated by the accumulation of ama. When ama, the toxic residue from poorly digested food, enters the blood stream, it can build up in weak areas of the body, including the joints. To remove ama once it has settled into the joints and tissues, the traditional purification and detoxification treatments, called Panchakarma, can be very helpful. These treatments help bring the aggravated doshas and accumulated ama back into the digestive tract for elimination. Once ama has been cleared, a program of prevention can be recommended. This will include life-style, diet and herbal recommendations that will help keep Vata in balance while supporting proper digestion so that ama no longer accumulated in the body. 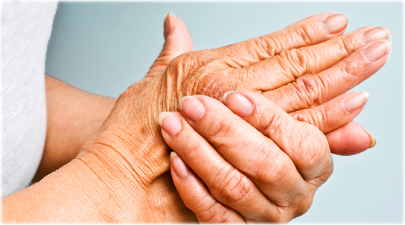 Treatment for arthritis is specific to the dosha that is aggravated. But it is also important to understand that the underlying cause of arthritis is poor digestion. Because of a person’s underlying constitution, diet, life-style and daily routine, Vata, Pitta or Kapha can become aggravated. When that happens, that aggravation of doshas interferes with digestion, which in turn leads to the creation of ama, a sticky toxin. Ama accumulates in the colon from where it gets absorbed into the body and circulates, eventually accumulating in the tissues and joints. The ama is “flavored” by whatever dosha is out of balance: thus there is Vata-aggravated ama, Pitta-aggravated ama and Kapha-aggravated ama. Ama settling into the joints is what causes the symptoms of pain, inflammation and swelling. If you are seeking alternative approach to dealing with joint pain, the best first step is a consultation with an experienced Ayurveda expert. Using pulse assessment, an expert can see the root cause of your particular kind of arthritis and design the most effect approach for your specific symptoms and degree of imbalance and accumulation of ama. Ayurveda Panchakarma treatments address arthritis on many levels. Panchakarma begins with a home cleansing program that starts to loosed and remove impurities and helps open the channels of elimination in preparation for the more intensive treatments. The treatments themselves are gentle, yet powerful cleansing therapies that remove the toxins and impurities from your tissues and help open the channels of circulation and elimination. An individualized treatment program will be designed to specifically address the dosha that is causing problems, as well as removing ama and blockages from the joints and tissues. In this treatment a continuous stream of warming herbalized oil is poured over the entire body. The oil soaks through the skin, penetrating deep into the body’s tissues. This softens the skin and mobilizes impurities. It also helps to balance Vata dosha and ease stiff joints. Boluses filled with a mixture of rice cooked with milk and Ayurvedic herbs are used to give a full-body massage. This treatment balances the physiology, and strengthens and nourishes the muscles and joints. It is often recommended for with those with joint pain from arthritis as well as those suffering from joint and muscle pain caused by accidents and injuries.